As educators, we always seem to be in the process of change: new standards, new assessments, new ideas and theories about teaching and learning. Much of the call for change comes from external sources, in the form of national and state policy (see earlier blog on this topic: The Complexity of Changing Outcomes for Students). But there is also internal change that teachers and administrators embark on, to create better learning conditions for their students. Internal change efforts are not any easier to accomplish, even though the impetus comes from within. In part this is due to how any faculty reacts to change. 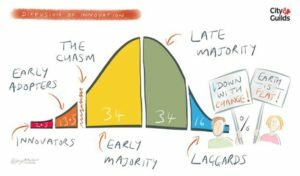 While not a new idea, I found this bell curve illustration of how innovation occurs to be particularly useful to the discussion of achieving positive change. 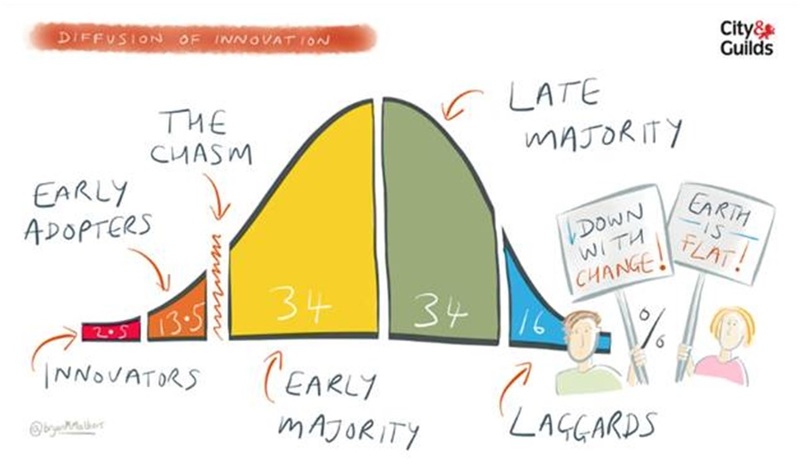 The graphic speaks to where we direct our efforts when embarking on an innovation or change initiative that promises better results than we are now achieving. There is often a tendency to try to enlist those who are unlikely to change, and with whom we will invest a lot of energy with little to no immediate return. Our rationale is that those least likely to change are in most need of change. However, experience tells us that the innovators and early adopters are those most likely to embrace new ways of thinking about teaching and learning, as well as new technologies and approaches. The 16% of the faculty they represent (going back to the bell curve statistics and graphic) become the standard-bearers for their peers, and their successes at implementing new practices will influence the rest of the faculty. This idea was also advanced with great effect by the late Phillip Schlechty, in a number of his books including Shaking up the Schoolhouse: How to Support and Foster Educational Change (2001 Jossey Bass Publishers). Schlechty often used the metaphor of the pioneers, settlers, fence sitters, etc. but the idea is much the same: as a school leader you want to focus your efforts and support on those teachers willing to take risks to improve learning conditions for their students. With their success comes a willingness of the early majority to engage in the change effort, eventually building critical mass. Will all faculty members eventually join in or will some continue to hold out, satisfied with current methods and results? I’d like to suggest two possible responses. The first is that with any process of change, you need some naysayers, to point out possible barriers or unintended consequences. These teachers will compel you as a formal school leader to explain the rationale behind the needed change and what the intended outcomes will be. Sometimes the concerns they raise will help you avoid roadblocks and refine your thinking and the thinking of innovators and early adopters. Their attitude may not be completely unwarranted, given the continuing cycle of school change, new policies and legislative mandates, and shifting accountability systems. The second response, based on my experience as a high school principal and assistant superintendent for instruction, is that some people take longer to get on board, needing evidence that the change will achieve the desired results and is therefore worth their time and energy. And a few never get on board for either personal or professional reasons. This leaves you with some tough decisions as a school leader, including whether the culture of your school can allow for non-participation, and also whether those resisting the change are sufficiently effective to ensure their students are not shortchanged. This entry was posted in Blog and tagged accountability, administration, innovation, leadership, process of change. Bookmark the permalink.